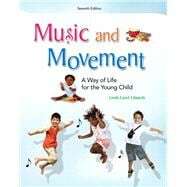 By balancing reasearch coverage and theory with applied practice, Music and Movement: A Way of Life for the Young Child, Seventh Edition,gives the most comprehensive and current treatment to the topic of music and movement while encouraging teachers to not only inspire young children to move with music but be inspired themselves to join our youngest musicians and dancers in the fun. Linda Carol Edwards is a professor emerita of early childhood at the College of Charleston, Charleston, South Carolina, where she taught both graduate and undergraduate courses in the visual and performing arts. Her degrees include a BA from Pembroke State University and an MEd and EdD from the University of Massachusetts at Amherst. Before moving to the college level, she taught kindergarten for 12 years in the public schools of North Carolina. Dr. Edwards is the author of The Creative Arts: A Process Approach for Teachers and Children (Pearson/Merrill), which is now in its fifth edition. She has been published in Young Children, Science and Children, Journal of Early Education and Family Review, Dimensions in Early Childhood, and the Kappa Delta Pi Record. She also serves on the advisory board of Annual Editions: Early Childhood Education. In addition, Dr. Edwards’s experience allowed her to create undergraduate and graduate programs in early childhood education that have received NCATE/NAEYC approval. As an advocate for arts education for young children, she takes the opportunity to present at local, state, and national conferences about the importance of the visual and performing arts in the lives of young children.